The Tuesday Tweet Up at Pittcon tradition continues! Network with Pittcon Tweeters and share your tips and experiences with social media at the Pittcon Tweet Ups held on Tuesday, March 19. This entry was posted in Pittcon on March 13, 2013 by Steven Miles. ArabLab is the best trade show for the Analytical Industry that reaches chemists from the Middle East, Africa, the Indian subcontinent, China, and Asia. We arrived in Dubai a few days ago and have been overwhelmed with the beauty of the region. Our experiences at ArabLab have been incredible, meeting with distributors, experts in the chemical field, and companies interested in the latest Chromatography information. We owe a huge thanks to our friends at Channels – Anne, Bhavna, Sana, and Mohit – for introducing us to several of the companies in the Dubai region. This entry was posted in Arablab on March 11, 2013 by Steven Miles. 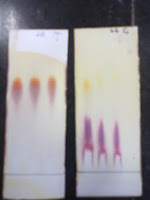 This entry was posted in Thin Layer Chromatography, TLC on December 17, 2012 by Steven Miles. This entry was posted in Thin Layer Chromatography, TLC on December 13, 2012 by Steven Miles. We are thrilled to find web sites, blogs, videos, and posts centered around chromatography, and we enjoy sharing these finds! Nitin Vasava is a pharmacist who created the blog pharmastuff4u. Identification of compounds: Thin layer chromatography can be employed in purification, isolation and identification of natural products like volatile oil or essential oil, fixed oil, waxes, terpenes, alkaloids, glycosides, steriods etc. Examination of reactions: Reaction mixture can be examined by Thin layer chromatography to access whether the reaction is complete or not. This method is also used in checking other separational processes and purification processes like distillation, molecular distillation etc. Very little time for separation is required. The lower detection limit of analytical sample in TLC is approximately one decimal lower than that is paper chromatography and very small quantities of sample is sufficient for analysis. We would not be here, and you would not be reading this post, if it were not for one man. Matt Lamkin founded our company in 1961 – he has been a truly great leader, mentor, and friend to everyone in this company. Matt passed away recently, leaving all of us with both great memories and a sense of loss. We join all of Matt’s family and friends in saying farewell to a man who made a difference to all of us. This entry was posted in Matt Lamkin on November 20, 2012 by Steven Miles. This entry was posted in Analytica China, chromatography on October 17, 2012 by Steven Miles.